I cannot live on tomorrow's bread." In the early 60s, many large cities started a plan called urban renewal - it was a way to make space for the new large buildings that they planned to build in the future. In most places, urban renewal meant the displacement of the people who lived in the neighborhoods that were being destroyed to make way for the future. 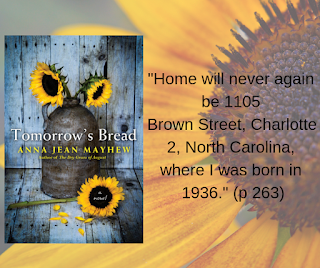 Tomorrow's Bread is about urban renewal in Charlotte, NC in the early 1960s, where an entire area was wiped out called Brooklyn. The residents of Brooklyn were mostly black and poor but they had a community of friends and pride in their area that had existed there since the end of the civil war. Brooklyn was self-contained and vibrant and had its own restaurants, schools, and churches. Generations of families have lived here but thanks to urban renewal, they are being forced out of Brooklyn street by street until the neighborhood no longer existed. This story is told from three viewpoints - Loraylee who lives in a home with her mother, her uncle and her son. She is in love with the white manager of the cafeteria she works at and he is the father of her son - something that had to stay secret during this time. Pastor Ebenezer Polk is the leader of a church that will be demolished with a graveyard that must be moved. There is also a white viewpoint from the wife of one of the men on the planning board who are in charge of the demolition of Brooklyn. She feels the wrongness but knows that there is little she can do. With these three divergent voices, we learn about how urban renewal will affect the families of the people who have lived in Brooklyn for generations. I especially enjoyed the life journey that Loraylee was on. She worked full time, took care of her son and her senile mother but still tried to do the best she could for her neighbors and friends. She knew that leaving Brooklyn would be difficult because generations had lived there and supported each other through the years. She also knew that it would be difficult to find another home for her family in segregated Charlotte. This was a well-written, well-researched novel about a little known area of Charlotte, NC in the 1960s. After I finished the book, I wanted more information about it and found several interesting articles. I love it when I enjoy a book and also learn about a part of history that I had no idea happened. 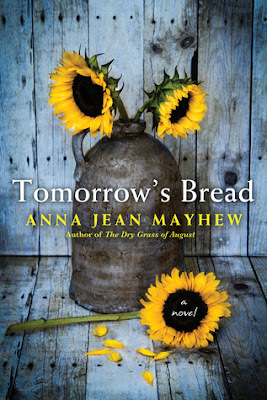 This is one of those books - you will love these characters and ache with them as they leave their old lives behind and work to create new lives in areas very different from the life they've always known. Check out our current giveaway with JORD Watch. I love that cover, and the topic is fascinating to me because I remember the impact of urban renewal on some cities in which I've lived. Thanks for sharing, and for visiting my blog. Good pick and important topic. Thank you, Susan Roberts, for your in-depth review of my novel. You really got the story. What I most wanted to convey was how wrong it was (and still is) to wipe out neighborhoods with little or no consideration for the residents, and I see that you totally understand that. So appreciated. A.J. - thanks to you for writing such a wonderful book. I live in NC but didn't know anything about the urban renewal in Charlotte. It is just so wrong (no matter where it happens). What a fascinating topic for a novel! I can't say I've come across something similar in fiction, and that really intrigues me. Great review! Stephanie, I have read a book about the results of urban renewal in Paris but never one set in the US. This book was a real eye opener for me. I too love the cover! It sounds interesting and I like that it's based on truth. Great cover and sounds like a good book. I'd definitely keep reading. Love the cover and title also.